Every holiday season starts out the same. The lights start appearing on houses and buildings, the radios start playing the wintry recognizable tunes, and as the ads start popping up, you start to think about your gift list this year. You’ll run through the list of loved ones as usual, thinking about what each person will love and find truly appreciate. But if you’re like most people, the run-of-the-mill presents and toys have already been covered. Even though every holiday seasons starts out the same, this year deserves to be a little different. With Azeal Dermatology, you can give the gift of healthy skin to any and every loved one. With aesthetic services (like hydrafacials and chemical peels), body care options (like microneedling), cosmetic treatments and so much more, there’s something for everyone at our Boulder dermatology studio. Learn more about giving the gift of healthy skin, and set your loved ones (including yourself!) up for success this holiday season with Azeal Dermatology. Why give aesthetic and skin care treatments as a gift? Our skin is one of the first things that people notice about us. If we love our skin and how it looks, we carry that confidence with us. If we’re not a fan of our skin, we do what we can to cover it up. Most of us fall somewhere on that spectrum, but at Azeal Dermatology, our goal is to have everyone we work with simply love the way they look. When you love your skin and feel confident about it, this mindset truly affects everything you do. You feel more able to own your looks and who you are, and your self-worth shows itself to others. You won’t spend minutes thinking about how to conceal your skin, or hours worrying if people are noticing that one blemish you simply can’t stop thinking about. You won’t be avoiding certain clothes that reveal skin imperfections that are regularly on your mind. Loving your skin saves you time, relieves you of anxiety, and makes it so that your skin is just another part of your body — something you’re grateful for, but mostly don’t think twice about. When you give a loved one a gift card to Azeal Dermatology, you’re giving a gift that goes far beyond an hour-long skin treatment. You’re giving the gift of renewed self-esteem and self-love. That’s a present that is worth its weight in gold, and one that will never be forgotten. We can all think of someone who would never treat themselves to some of the skin care services at Azeal Dermatology. These are the people who don’t think it’s important, or are always doing a million other things for everyone else that they forget that they, too, need taking care of. Or this is the person who has accepted their fate, and feels that they’re destined to have their skin in all its imperfections forever, for better or for worse. There’s nothing wrong with these thoughts, except for the fact that there’s a lot wrong! Self-love can only happen when someone puts themselves as a priority — self-care is a building block towards true self-love. Accepting your skin for what it is, even when you’re not happy with it, is denying yourself the opportunity a look and feel that you love. Our dermatologists are all about cherishing the body that you have, but your body is also a work of art. And works of art are never truly finished. Just like we can’t suddenly stop eating healthy or being active, it’s harmful to think that we can’t do more to help our skin thrive. For the people in your life who struggle with the idea of treating themselves (and this might even ring familiar for yourself), there’s no better time to encourage them to spoil themselves than to get them set up with the extraordinary gift of a treatment from Azeal Dermatology. Whether they go for a hydrafacial or one of our laser treatments (or anything else! ), they’re going to walk away from their appointment feeling thankful for you, and thankful that they went. 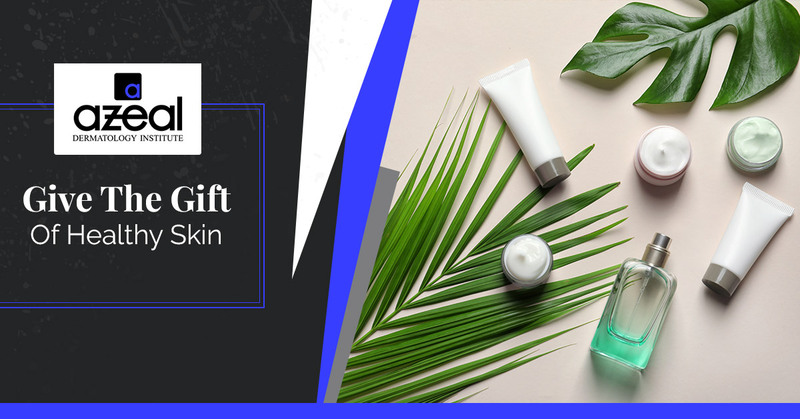 How do I give the gift of healthy skin? With Azeal Dermatology in Boulder, it’s never been easier! For starters, you might already know what your loved one is looking for this holiday season. They might have mentioned wanting an anti-wrinkle treatment, or maybe your loved one is a regular with us and you know what service they go for. If that’s the case, you probably already know what to get them. You are more than welcome to call our studio and talk about setting up a prepaid appointment for them. Just make sure you pick a date that works for your loved one’s calendar! If this is your loved one’s first time with Azeal Dermatology, we offer gift cards that allow them to choose what service is most up their alley. There’s a chance that they might not have any idea where to start, and that’s understandable — our dermatologists can perform a wide variety of skin care services! You can help them by going through our services to see what we offer that they might enjoy the most. Then, make a list of ideas to give alongside the gift card that can serve as a guide. Or, spend some time on our site with your loved one, and help them pick out a service they would thoroughly love and appreciate. Whether you live in Boulder and your loved one does not or the other way around, Azeal Dermatology can still make for a perfect holiday present! For starters, our online store has a number of incredible products that make for amazing stocking stuffers — think skin creams, eye creams, tinctures, and essential oils, to name a few. These are easy to purchase and ship right to your loved one’s door. Secondly, if your loved one is close to Azeal, you can still hook them up with any of our phenomenal products, or you can purchase a gift card for them. Either way, your thoughtful gift will make a difference in your loved one’s life. What skin care treatment will my loved one appreciate? Teens and young adults can benefit from our general dermatology appointments. Set up a consultation with our dermatologists to get further recommendations! We have a number of cosmetic procedures they can try. Laser treatments and Botox® are two such procedures that can help smooth out fine lines and wrinkles. Schedule them a waxing session at Azeal Dermatology! From eyebrows to other facial hair, we’ve got you covered. Hydrafacials, medical facials, and chemical peels might be able to do the trick. Check with our specialists for further recommendations, or schedule an initial consultation. We offer a variety of general dermatology treatments that can make a difference. Treating warts, skin disorders, infections, or scars are all things that can be addressed at Azeal Dermatology. Look into our man cave section to see all that we can offer! Dermatology and skin care is not only for females — guys need to be pampered and practice self-care, too! If your loved one is YOU! Everyone deserves to be spoiled, and it’s more than OK (and necessary) to put yourself at the top of that list. There’s no better time than the holidays to give yourself a gift that you know you’ll love. Our dermatologists at Azeal Dermatology is more than happy to help. Are you ready to start loving your skin? Are you excited to give your loved ones gifts that they’ll love and think about for years to come? We can’t wait to work with you. Schedule your appointment with Azeal Dermatology in Boulder, order skin care products online, buy gift cards for that special someone, and have an amazing holiday season!